Massachusetts’s population is 8% Hispanic, the 19th highest Hispanic population share nationally. New Mexico ranks first with 45%. 5% of eligible voters in Massachusetts are Latinos, the 14th largest Hispanic eligible voter population share nationally. New Mexico ranks first with 38%. 48% of Latinos in Massachusetts are eligible to vote, ranking 15th nationwide in the share of the Hispanic population that is eligible to vote. 36% of Hispanic eligible voters in Massachusetts are ages 18 to 29. Only 20% of all Massachusetts eligible voters, 31% of Latino eligible voters nationwide, and 22% of all U.S. eligible voters are in that age range. 22% of Hispanic eligible voters in Massachusetts are naturalized U.S. citizens, greater than the share for all Massachusetts eligible voters (9%) and all eligible voters in the U.S. (7%). 27% of Latino eligible voters in Massachusetts have not completed high school, similar to the share of all Latino eligible voters nationwide. Only 11% of all Massachusetts eligible voters and 14% of all eligible voters nationwide have not completed high school. Only 34% of Massachusetts Hispanic eligible voters live in owner-occupied homes compared with 70% of all Massachusetts eligible voters. Hispanic eligible voters in Massachusetts are less than half as likely to live in an owner-occupied home as are all eligible voters in the U.S.—35% versus 71%. 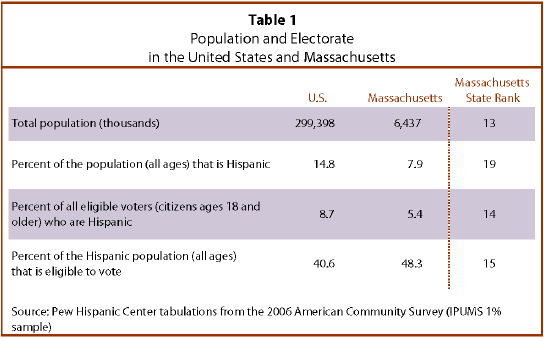 Latino eligible voters outnumber black eligible voters in Massachusetts—246,000 versus 207,000. Latino eligible voters are younger than white and black eligible voters in Massachusetts. 36% of Latinos are ages 18 to 29 compared with 18% of white eligible voters and 28% of black eligible voters. Black eligible voters in Massachusetts are slightly more than likely to be naturalized citizens compared with Latino eligible voters—24% versus 22%. 74% of white eligible voters in Massachusetts live in owner-occupied homes compared with 35% of Hispanic and 44% of black eligible voters.